Thinking of changing from my excellent Be Unlimited 15mb down / 1mb up connection. I want the faster upload. Don't mind paying the premium. Anyone on here changed recently (from any ISP) to AA Fibre regret the decision ? I'm on aaisp fibre, and it's not the cheapest option around but it does exactly what I want, with consistent speeds all times of the day. I think that's pretty much across the board. A&A simply makes use of the infrastructure provided by BT / Be (be that copper for ADSL or fibre) and provides a [censored] good service over it. Yes, they are a little pricer than most other ISPs and but it's well worth it and more. I must admit, I am tempted to swap, but with such a fast connection it would be easy to use up the allowance watching iplayer etc. I've also been researching online backup services. It appears that there doesn't appear to be any (suitable for a home user) which have above 2meg upload speeds (I was thinking of paying for the 10meg and hope to get at least 5). The forums for mozy uk, crashplan, sugarsync etc have numerous complaints about slow uploads. Part of the problem (other than Mozy UK) appears to be because the datacentres are located outside the UK. Wuala should give you good upload speeds. My 10Mb/s upstream is maxed out. The big problem here is peak time, when allowance is called off at 2G/unit - if you can manage your use of the 'net at those times to keep it to a minimum then things are far more generous (100G/unit, more for a few hours overnight). Unless you have stuff you don't control coming in (my mail server for instance sees traffic from the outside that I don't control) or you are at home a lot during week days, not using much downstream bandwidth in the day should be easy enough. I generally leave the house before peak starts and don't get back until it finishes, so aside from things like my mail server and me occasionally connected via VPN my link sees very little downstream traffic at peak time. There will be more when I have some small web servers moved "in house", but that will mainly be upstream anyway. Sending stuff up to offline backups is not an issue any time of any day as upstream bandwidth is not metered. This is one of the many things I wanted the up-to-10Mbit upstream for. Downloading backups when disaster strikes will be metered of course, but hopefully you can do that outside the peak period. I've recently made that very same switch. I'd been a happy Be customer for 2.5 years, and will still recommend them to people who have them available but no FTTC (or who don't need (or don't want to pay the extra for) FTTC). I was connected on Friday and I've been most impressed over the 6.75 days so far. I've had two problems: a line issue that is BT not AAISP so I'd have had that with any ISP, and a reverse DNS issue that was fixed quickly (and may not be something you'll even care about). Response from AAISP in both cases was very good, even at the weekend. Line speed is excellent. I'm getting the full 10Mbit (well, as near to as makes no odds: 9995K) upstream sync which works out at an observed rate of 8.something on speed tests (1070KByte/sec when I set an throttled torrent going to see how far I could push it), though obviously you might not get that much depending on your line (check with http://dslchecker.bt.com/adsl/adslchecker.welcome - it guessed I would get 32down and 7.8up so either that was quoting expected observed speed or the figures were an underestimate as I get 35d+10u (it may, or course, overestimate in some cases too)). The downstream sync I'm getting is ~35M. 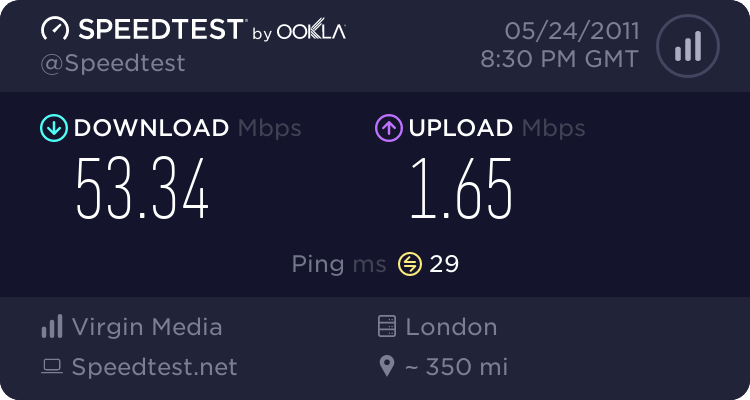 Observed speeds have been more variable than upstream but that could be the other end of the communication not being able to keep up with my shiny new link or congestion on BT's part of the arrangement. 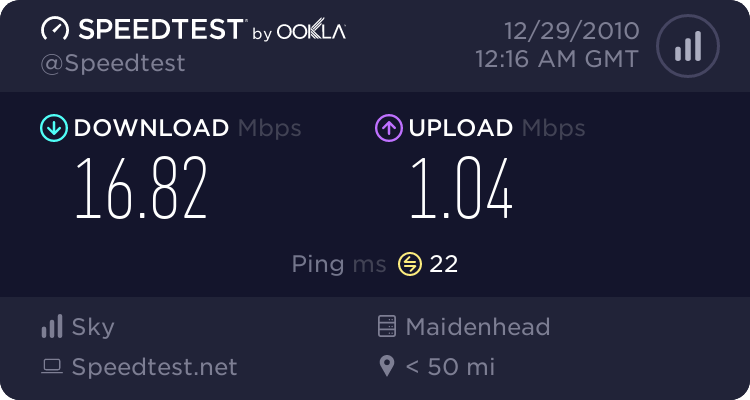 I've not tested this much, as upstream was the important thing for me, but when I have it has always come out better than I was getting on ADSL (12Mbit), usually significantly better.